Nothing compares to the grace and beauty of a tipi. Its conical shape allows it to withstand very high winds. Its simplicity belies its ability to create the perfect environment at any time of year; well ventilated and cool in summer and warmed by the fire in winter. After spending time in a tipi you will be hard pressed to find another form of shelter to compare with it. 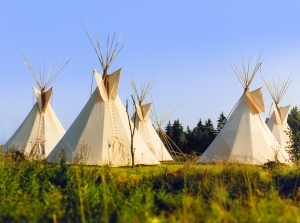 We strongly recommend the use of a lining as this makes the tipi a comfortable place to be. It prevents drafts and helps to stop rain dripping from the poles. It creates an insulating barrier and helps to draw smoke from the fire upward and out of the smoke flaps. The ozan is really for serious tipi dwellers only. It acts as a ceiling/partial ceiling extending from the rear of the tipi. In severe weather it can be used to stop any raindrops reaching the living area and as long as a gap is left for the smoke to escape it can also help to further insulate the living space. If you can make your own tipi poles then you will appreciate your tipi all the more for the work involved. We recommend spruce as an ideal pole but any straight softwood will do. Use a draw-knife to shave off the bark and smooth the pole. If you can’t make your own we’ll be happy to provide them for you. Upon request we can also provide you with divided tipi poles. These are essentially cut in half at an angle and then reconnected with the aid of wooden pins. These are virtually invisible and whilst they will never be as strong as standard tipi poles they do make transportation an awful lot easier. Our canvas comes as standard in a natural off white colour. We can also make your tipi in the colour(s) of your choice but please note coloured canvas is only available in 300g (10.5oz).